The mirror, which has a wide frame in unfinished wood, is firstly given two coats of white acrylic paint. 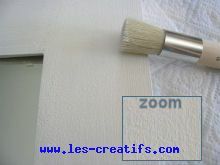 Next, in order to create a smoother finish and to hide the brush marks created by the flat paintbrush, another coat of the same color is dabbed onto the surface. 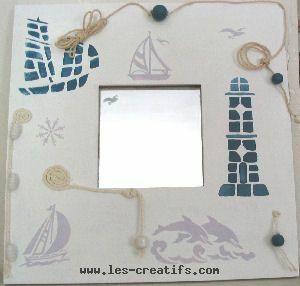 A ''mosaic look'' lighthouse and boat are painted on either side of the mirror frame using a stencil. Two shades of blue are used (add a little black to get this ''deep sea'' blue). Next, the Magic Motifs are applied. 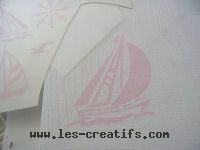 The designs are easily transfered by pressing the motif (first remove the protective film) upon the place where you want to stick it by rubbing the transparent film in order to make the motif stick properly to the frame (the glue for the motif is pink). Then you take this film off and rub the motif with a sheet of sky blue flocking fiber: the velvet will remain. Next, set the bits of rope into position... These beads are painted in white and various shades of blue (the same shade of blue as that used for painting with the stencil) and placed upon skewers to dry. Next, thread on the beads onto the mini bits of rope to represent buoys. These bits of rope are fixed to the mirror with the glue lines which are very easy to use and are strong enough to take the weight of the beads. 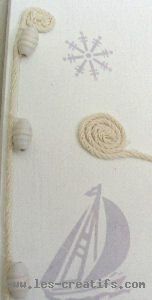 make a 'snail' shape out of the glue lines, then attach the bits of rope for a rolled-up rope look. 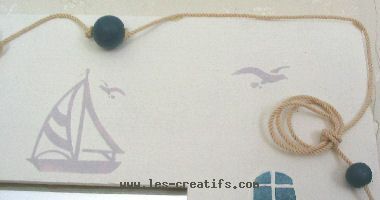 Hang a few beads from the rope, using a 5 mm strip of glue line. Where can you buy the materials for these craft designs?